A while ago, when the Canadian government abandoned the ‘long form census’ and stopped collecting unnecessarily intrusive information about us, the citizens, this simple act generated great controversy. Not just in the media – inside my family, too! It is a difficult admission to make, but, alas, it is true! My father-in-law and I love each other very dearly – and truly respect each other as professional adversaries – but, when it comes to individual freedom versus central government control, the two of us just don’t agree… And every chance we get (much to the chagrin to the other adults in the family), we battle for the souls of the next generation of our family!!! Especially my children – his grandchildren. And whatever else he may be, my father-in-law is brilliantly eloquent and very, very persuasive. Neither of which traits I posses: rather, I counter simply with the ‘deeply uncharismatic’ reason. So, back to the time when the mandatory (as in – you’ll go to jail if you don’t reveal to the government your innermost secrets) ‘long form’ (i.e. constitutionally – none of the government’s business) census was controversially being cancelled. Did I mention that my father-in-law, while a student of Economy and Political Science (sic) at Ottawa U wrote an essay deeply critical of Lester B’s economic policies? Little did he know that his prof was Lester B’s drinking buddy…and mocked him with my father-in-law’s essay. And – he offered my father-in-law a job. On the spot. As his special economic advisor! Needless to say, my father-in-law accepted. He advised Lester B on economy while he was the leader of the opposition – and penned the wording much of Lester B’s laws – especially anything even remotely dealing with the economy, while Lester B was the Prime Minister. And he advised and briefed many of Lester B’s ministers: from PET through Chretien to Martin and many, many others. And, he mentored many subsequent top civil servants…some of whom tried (unsuccessfully) to rope me into what eventually turned into the sponsorship scandal…but that is a different story. My mother-in-law still has a scrap book of all the political cartoons that included my father-in-law – from all the main stream media publications of those days. And yes, when PET came to power and refused to heed my father-in-law’s advice (which, surprisingly, was actually reasonable) regarding Alberta’s oil-sands, my father-in-law could no longer take the Liberal corruption and resigned. As he says: he used to be a classical liberal – but he held on to his morals while ‘his party’ drifted away from him. OK – I’m ranting – I beg your indulgence. 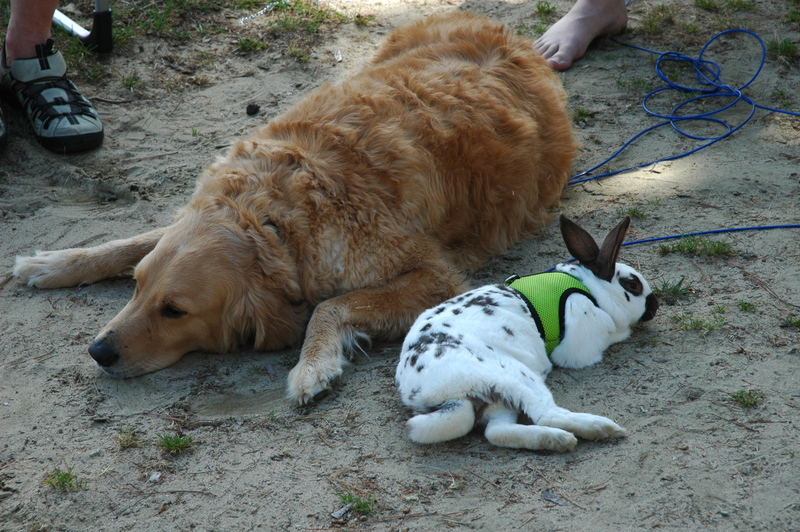 Back to the issue of the ‘long form census’: we were up, at a cottage in northern Quebec, with the dog and the rabbit curled up by our feet, arguing over the benefits vs evils of the ‘long form census’. And, being the eloquent/charismatic one, my father-in-law was winning the argument – winning my babies’ minds over to the dark side! That is – until I asked my sons what do they think the government was going to DO with all this information. Why bring up this story now? The following video contains very strong empirical evidence for the benefit of denying governments the type of information they are most likely to seek, which would give them excuses to justify interventions in areas they have no right to intervene and interfere in! I had hoped to hold a Draw Muhammed day event in Canada’s capital, Ottawa – on the grounds of Parliament Hill – yesterday, May 20th, the International Draw Muhammed Day. As per instructions, I applied for the appropriate permit and was told (via phone) that all was in order and only the security issue needed to be addressed before the permit would be granted. So, I worked with the Protective Policing detail of the RCMP, the people in charge of the security of The Hill, to move the time and specific location of the event in order to make it as easy for them as possible to ensure the safety not only of this event, but also of every other visitor to The Hill. In order to ensure this could not possibly be interpreted as an attack on one religious minority and their beliefs, I ensured that this event would be critical of all religious persecution of freedom of speech: since the Pope claimed violence would be a justified response to an insult to his mother, I invited people to draw the Pope’s mother; since people are in jail for having used an image of Buddha with headphones, I invited people to draw an image of Buddha with headphones. And, to demonstrate that the prohibition against depicting the likeness of the Islamic Prophet Muhammed is by no means as universal as some loud voices today would have us believe, I planned to display historical Islamic depictions of Muhammed. In addition, I invited people to draw any other religious/political figure they want – this was a freedom of speech event at the occasion of the International Draw Muhammed Day, nothing less or more. After both an email and phone exchange with various members of this team, I had met with them – in a local coffee shop, none the less, and was told that thanks to my eager cooperation, all of their security concerns had been addressed and the permit would be issued within hours. Naively, I believed what I was told, and started to let people know about the event. Being just one individual and not a member of any organization or political party, I simply posted the info on my blog and sent emails to my friends, who sent emails to their friends, and so on….a word of mouth thing, as I have no budget for ads and such. RISE Canada even took it upon themselves to put up a Facebook page for the event, as I had not even the skills for that. I waited for the promised paperwork, and waited, and waited. As of Tuesday afternoon, I was assured it was coming. Then, at 5:25pm on the 19th of May, I received a phone call informing me that the permit for the event was denied. Frankly, I was surprised and at a loss for words – I did all I was told and was assured that all ‘security concerns’ were fine – yet, it was precisely ‘security concerns’ that were cited as the reason fro the denial. No explanation for what these ‘security concerns’ were was going to be provided. I contacted the RCMP protective detail assigned to me for the event and let them know….and while I realize I don’t understand internal politics, it seemed to me that they were not the ones with ‘security concerns’. Anyhow, everybody respected the prohibition against the event – only some reporters and numerous security forces were reported to have shown up…. I have been asked by many people to please re-schedule the event for another time and that is indeed what I will do. Anyhow, that is the stage in which things find themselves now. This is a continuation of a prolonged court, the earlier bits of which are here: Day 1 part 1 and part 2 , Day 2, Day 3 and Day 4 part 1 and part 2 of this trial were covered in March, 2014 (write-ups by me at links). Day 5 is more or less covered by days 6 and 7.… Day 6 is here. Day 7 part 1 is here – sorry about having had to chop this up into short little bits, it seems my original write up was too long for WordPress to format correctly… part 2 is here. Dr. Baglow’s impression of my coverage of the court hearings, as per Twitter, is here. September 15th, 2014 account is here. Roger Smith presented his side of the story (defense) and was cross examined. September 16th, 2014, was the second day of the trial phase where the defense gets to present their case. Today was the day that, as Minister Jason Kenney referred to her, ‘the famous Connie Fournier’ took her place on the stand. Having made my way past the hoards of reporters and cameras positioned in front of the courthouse (as all cameras are banned not just in the courtrooms, but everywhere within the courthouse) and waited with baited breath, in front of Courtroom #20 at the Elgin Street Courthouse in Ottawa. I was rather taken aback by the unusually large group of people also waiting in front of Courtroom #20… I was sure Madam Justice Polowin would try to stay in the same courtroom, but these people looked unrelated to this case. At 9 am, they all filed into the courtroom – much to my bewilderment (yes it does not take much to bewilder me….). It turns out that Madame Justice Polowin also had this child custody case that needed to be heard and she had scheduled it before the Baglow vs. Freedom of Speech case I was there to cover… You have to admire a judge that will juggle multiple cases at once: it may not look so on the surface, but, in order to ‘do justice’ to a case (if you will excuse the turn of phrase), a judge has to read TONS of paper (almost literally! )….and to be up to speed on multiple cases at once would require such a sharp focus that I must admit I am awed by judges who make it look effortless. By 10 am, the earlier case people had filed out of the courtroom and we all filed in – with the judge still sitting at the top of the room. And she looked ready for the day!!! Dr. Baglow had exchanged his blue shirt for a cream one – otherwise, he either has multiples of the same dashing black suit or he wore the same one as yesterday. He also wore his signature black riding boots with the adorable silver trimmings – and, for the record, they were spotless and shining! The ever-charismatic Mark Fournier, who had worn a cream shirt with yesterday, had exchanged it for a blue one – but much darker one than Dr. Baglow had worn yesterday. Ok, ok, I am a sucker for patterns…but it did not look like the two had swapped shirts! The lawyers looked their ‘selves’ – in their lawyer robes and black shoes to match…difficult to write up their fashion sense since they have to wear these traditional outfits which make them look the same day after day…. Now let me get to the star of the day – and I do mean star!!! Connie Fournier wore a very flattering dress: power red, textured knit, with cap sleeves…fitted through her bust through to her narrow waist (accentuated by a thin, shiny black belt) and with a playful ‘twirl’ bit at the bottom, which was just below her knees. Her outfit was perfected by her perfect black pumps – not too high, but high enough….the heel being not too thick, neither a ‘slutty thin’… She looked perfect – a force of nature!!! As well-dressed as she was for the court, Connie Fournier’s mind was in even better a shape or state of readiness… But, that is Connie!!! No matter what situation life hurls her into, she is there, ready, brilliant – and smiling to boot! There are very few people on this Earth whom I admire as much as I admire Connie Fournier! The day started out with Connie Fournier on the witness stand, testifying to her own defense. I was there for much – but not all – of Connie’s testimony – and I had to leave before the cross examination started: my apologies to you, my readers, but I am not a lawyer or paid to report on things, and my other-life-pressures have put a limit on the time I can spend in the courtroom… I just wish there were other people, better versed in legal matters, who could/would report on this momentous case….but, alas, there seems to be a dearth of them, so you, my dear readers, are stuck with my limited and incomplete observations. My apologies go to you! Connie had testified to many of the things we had heard in the courtroom before – but presenting them from her unique and informed point of view. For example, it seemed funny to me just how Dr. Baglow seemed to shrink in his seat as she testified about the many and various instances where Dr. Baglow, using his Dr. Dawg personna, smeared Connie Fournier as a ‘white supremacist’ and a Nazi sympathizer – all the while as Connie Fournier’s metis husband was sitting in the spectator section of the courtroom…because, them ‘far right’ ‘white-supremacists’ and ‘Neo-Nazis’ go out of their way to marry people with a Native-Canadian background!!! Let me just stress that I am convinced Ms. Fournier is neither a ‘white supremacist’, nor a ‘Neo-Nazi’: not ‘just’ because she is married to a man who is a metis, but also because her father is an evangelical minister and she takes her Christian roots very seriously – including the ‘love thy neighbour’ and ‘all human lives are sacred’ bits. I’m just waiting for the so-called ‘progressives’ to try to pain Mark Fournier as ‘a white metis’…. September 18th, 2014 – the day of the expert testimony Part 1 is here. Earlier in August, I watched an interesting case be argued (though very briefly) in Ontario Court. In Part 1 of this series, I explained a little of the background of the ongoing Presto scandal, which has already cost Ontario taxpayers half-a-billion dollars – and how a concerned taxpayer (hereafter referred to as CT) had searched for who was behind this…and discovered the documents had been signed by none other than Kathleen Wynne, then Ontario Minister of Transportation and now the Premier of Ontario. In Part 3 of this series, I explained a bit about the concept of ‘summary dismissal’ – using the example of Baglow vs. Free Dominion and John Does as an example. In Part 4 of this series, I sketched the atmosphere that morning and wondered at the difficulties our wonderful civil servant had in telling everyone – the plaintiff included – where the hearing is to be held. On August 18, the Judge ruled that Applicant may bring proceeding against the Ontario Government, and the Crown must delegate authority to intervene to the Federal Director for Public Prosecutions. A concerned taxpayer brought the motion and it will be heard on Sept 4 at 9am. The issue is the threats by former MTO Minister Kathlynne Wynne to force TTC and OC Transpo to breach the Federal AIT (Agreement on Internal Trade) and Federal Gas Tax which has cost taxpayers up to $0.5 billion enrichment for private interests at taxpayers expense. If you’re in the area and can spare the time, I hope to see you there!!! Give us your land for one dollar – or you go to jail!!! Please, indulge me for a while…I promise I’ll get to the point, eventually. If you sent your child to school with a yummy lunch and someone used the threat of force to make your kid ‘sell’ them their whole (and much more valuable) lunch for a dollar – would that be acceptable? How would you react? If you (rather than your child) bough a lunch and someone used the threat of force to make you ‘sell’ them your lunch for a dollar – would that be acceptable? How would you react? If you bought a pair of shoes and someone used the treat of force to make you ‘sell’ them these new shoes for a dollar – would that be acceptable? How about a car – would it be acceptable for someone to use the threat of force to make you ‘turn over’ a new car to them for one dollar? What about a house? Would it be acceptable for someone to use the threat of force to make you ‘turn over’ your house to them for one dollar? And if you purchased some land and planned to build a home on it – would it be acceptable for someone to use the threat of force to ‘turn over’ that land to them for one dollar? And what if you purchased some land and planned to build a more than one home on it – would it be any different? Would it be acceptable for anyone to force you (using threats of violence and imprisonment) to turn the land over to them for one dollar? Yet, that is exactly what is happening in Ottawa!!! What is worse, even though I took some time before writing this up to wait for a single news outlet to report this for the travesty that it is, not one of them has. Each and every one of the mainstream media outlets has interviewed only the people who are doing the forcing – and what is worse, they feel it is righteous of them to do this. Every single one of the reports on this ‘story’ have been deeply empathetic to the bullies and not the victim in this case. An eternity ago, when I was in high school, we studies a short story called ‘The Devil and Daniel Webster’. If you are unfamiliar with it, here is the story in a nutshell: a farmer has bad luck and eventually agrees to sell his soul to the Devil in exchange of 7 years of good luck. The Devil fulfills his end of the contract, even letting the farmer have an extension. Still unwilling to pay the price he had agreed to in the contract, the farmer hires the famous orator Daniel Webster to argue for him in front of a jury. Instead of judging the contract on the basis of facts, Webster manipulates the jury’s emotions to judge on the basis of ‘people=good, Devil=evil’…and gets the farmer off. When we discussed the story afterwards in the classroom, every single student – excepting me, of course – was happy with the way the story ended, hailing is as a ‘victory of good over evil’. I was not sure what I was more horrified at: that the story permitted the victory of ‘wrong over right’ or that so many of my classmates had been manipulated of their perception of ‘Devil=evil and therefore must be defeated by any means necessary’ and could not perceive that in this situation. the ‘evil’ Devil was actually in the right. By the way – my hubby had attended a different high school, but he, too studied this short story and he also was the only one in his class to argue ‘right vs wrong’ rather than ‘good vs evil’…. Why do I bring ‘The Devil and Daniel Webster’ up in this context? Because in today’s world, it is difficult to imagine someone more ‘devil-like’ than a land developer…except, perhaps, someone in the ethical oil/gas industry. In the Ottawa permutation of the story, a land developer had purchased land with the aim of building homes on it and, well, selling them. But, the City of Ottawa had decided that on the property this land developer had legally purchased, there ‘might’ have been some old and/or significant trees….and if the city’s agents deemed that this was so, the developer would be forced to ‘turn the land over to the city for one dollar’. In other words, the City of Ottawa was both the prosecutor and the judge – and, should they issue the arrest warrant, the executioner. Am I the only one who thinks this is not just plain wrong, but truly evil? Yet, every news source I heard or read is empathetic to the city, not the ‘evil’ land developer….